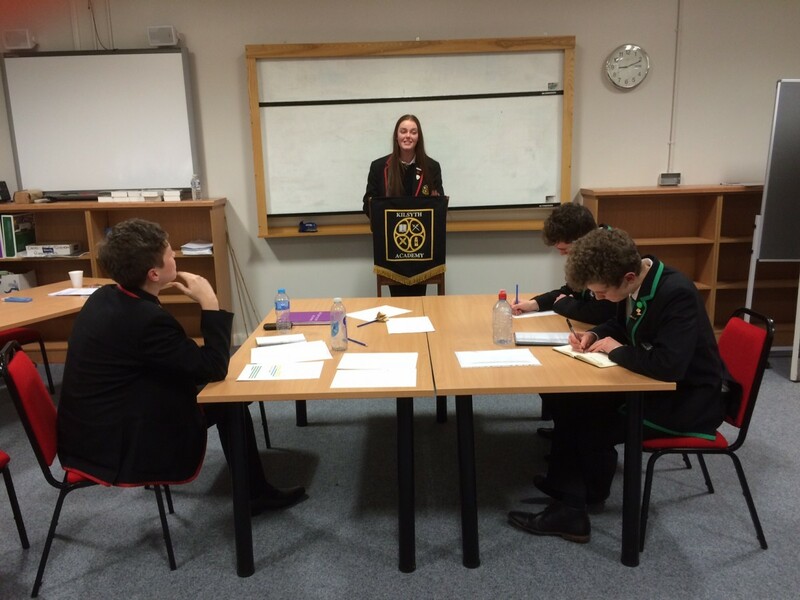 Kilsyth Academy took part in the 2nd round of the Donald Dewar Memorial Debating Tournament last week, proposing the very challenging motion “This House believes that compensation should be paid for the injustices committed by past generations.” The school was represented by Blair Anderson and Courtney Forsyth, who spoke extremely well against their opponents, The Glasgow Academy. In the second heat, Blair and Courtney proposed the motion once again, facing St Maurice’s High School, albeit they were only judged on their performance in the first heat. The standard was exceptionally high and the chairman of the Law Society’s panel of judges spoke about the high quality of debating from all three teams, before congratulating St Maurice’s High School on winning the heat and progressing to the next round. Well done! The S4/S5/S6 prelims are in full swing and parents will receive reports during February, together with recommendations for final presentation levels. Supported Study continues and it is vital that pupils take full advantage of this extra support, which is available at lunchtimes and after school. S1 Tracking reports will be issued this week, on Thursday 28th January and the S1 Parents’ Meeting will follow this on Thursday 11th February, from 4.15 until 6.45 p.m. This is an opportunity for S1 parents to meet class teachers and have more in depth discussions about their child’s progress during the first half of S1. We are encouraging all young people who will be aged 16 or over by 5 May 2016 to ensure that they are registered to vote in the forthcoming Holyrood elections. As part of this drive, we will be holding a ‘Register to Vote’ event during March. The closing date for registering to vote in the Scottish Parliament elections is 18th April. The mid-term holiday will be on Monday 8th and Tuesday 9th February and there will also be an in-service day on Wednesday 11th February. The school will therefore be closed to pupils on these three days. At the start of this very busy term, pupils in S4, S5 and S6 are getting ready to sit their prelim examinations, in preparation for the final SQA exams in May. Our prelim diet will run from Monday 18th until Friday 29th January and all pupils are expected to be in class, when they do not have an examination. Lots of advice about revision is available from class teachers and supported study has been running across many subjects. The renovations to our cafeteria are now complete, incorporating many of the ideas suggested by the Pupil Council. It’s looking great, with a far more modern feels to it. The S5/6 Burns Supper will take place on Thursday 4th February and plans are well in hand, for what promises to be an excellent evening of entertainment. We are delighted to welcome Mrs Frame back to the English department and Mrs Wewiorski to the Drama department. Mrs Frame will take over the classes of Mrs Coggill, following her move to Brannock High School and Mrs Wewiorski will be coving for the duration of Ms Langan’s maternity leave. We hope they both enjoy their time in Kilsyth Academy.